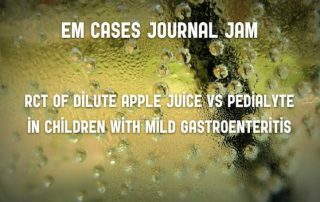 This is EM Cases Journal Jam podcast on a randomized control trial of dilute apple juice vs PediaLyte for mild pediatric gastroenteritis. While IV rehydration is required in cases of severe gastroenteritis (which we rarely see in North America) and oral rehydration with electrolyte maintenance solutions is still the mainstay in treating moderate gastroenteritis, could better-tasting, more cost-effective fluids such as diluted apple juice be just as effective as traditional electrolyte solutions in milder cases? Listen to Dr. Justin Morgenstern (@First10EM) interviewing Dr. Stephen Freedman, the world-renowned pediatric EM researcher who put ondansetron for pediatric gastroenteritis on the map and who was one of our guest experts on our main episode on Pediatric Gastroenteritis, Constipation and Bowel Obstruction, about this practice-changing paper. This is followed by a hilarious rant on the topic from Dr. Anthony Crocco ("Ranthony"), the Division head and medical director of pediatric EM at Hamilton Health Sciences. In Part 2 of this pediatric abdominal pain Episode - Pediatric Gastroenteritis, Constipation & Bowel Obstruction, Dr. Anna Jarvis, Canada's "mother of pediatric emergency medicine" and Dr. Stephen Freedman, one of Canada's pre-eminent researchers in pediatric GI emergencies, discuss the assessment, work-up and treatment of pediatric gastroenteritis, with particular attention to gastroenteritis & acute abdomen mimics, how best to assess hydration status, the nuances of the use of ondansetron and the prose and cons of various rehydration methods. A detailed discussion of the most common and lethal causes of acute abdomen bowel obstruction in pediatrics follows, including intussesception and midgut volvulus. Finally, the differential diagnosis and best management of the most common cause of pediatric abdominal pain, constipation, is reviewed.